Repeat Customer: "Hank did a excellent job refinishing my deeply gouged and scratched dining table. He was thorough and responsive to any calls or questions. I loved walking through his shop and seeing the passion he had for each piece! I will certainly be a repeat customer." Sorrel S.
Better than Ever: "When my husband and I got married 22 years ago, his grandmother gave us an end table she had in her home. It was in terrible condition due to heavy use during a home remodel and I feared it would not be salvageable. I took it to Hank and he restored it to better than I ever remember it. I had no idea there was wood grain in the light colored wood! I can't wait to take our dining table from my Great Grandparents to him next." Mindy W.
Superior Work: "Hank does beautiful work. He refinished my dining room chairs and it was amazing to see the wood restored to its original beauty. I also purchased bedroom furniture he had refinished and have been very pleased with it. 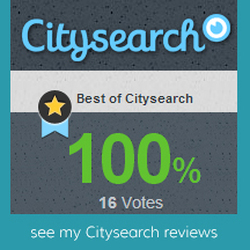 Superior work at a reasonable price plus Hank is a great guy to work with." 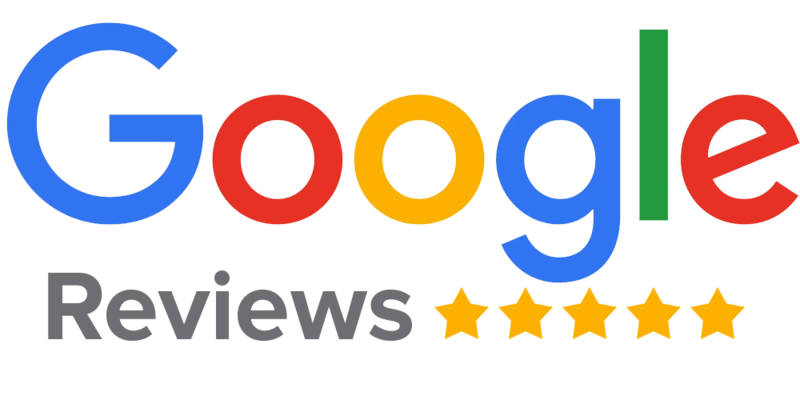 Marilou M.
Couldn't Give a Higher Recommendation: "Hank has done such an excellent job refinishing my furniture, that I actually load it in the car and drive it 200 miles north for him to do it. (I live in Austin!) I couldn't give a higher recommendation. And he's a really nice guy to boot!" William C.
Spectacular Job: "Hank rescued a Paul McCobb planner group kitchen table for me. The tabletop suffered some fairly severe water damage -- and after Hank's refinishing....there is no trace whatsoever. In addition, he removed some markings that had accumulated over time on the tabletop and the chairs. Spectacular job -- thanks, Hank!" James L.
He's Your Man: "I brought Hank a table that had sat outside without maintenance for years, and now it looks like it came out of the factory back in the 1950s - probably better, actually. He was very communicative, provided behind-the-scenes photos, and made his deadline. 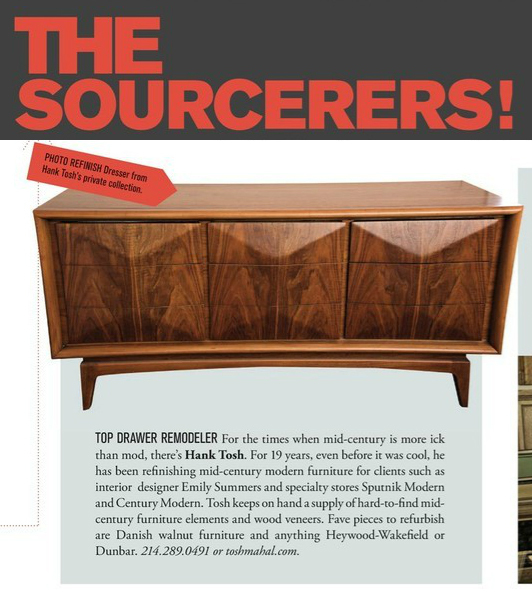 If you have mid-century wooden furniture needing refinishing, he's your man." Eric P.
Highly Recommend: "We recently moved out of storage and discovered our dining room table top had been dropped and absorbed moisture. This caused the wood to swell. Hank was able to get the top shape back correct form, strip the entire top and restain. Frankly, it looks better than when we first bought it. Hank's work is excellent and I highly recommend him. Thank you Hank." Steven S.
Perfect Condition: "We were thrilled to receive our Bassett Mayan series buffet today!!! It is beautiful and in perfect condition!!! We will do business again with Hank. He is honest and his work is meticulous!" Karen K.
My Go-To: "I was wandering down Henderson Ave. and after going into 2 shops and lamenting that they had such beautiful mid-century pieces that were way out of my budget and looked perfect, one of the shop owners took pity on me and shared that Hank Tosh is the man behind restoring all of the pieces. They find them, send to him to fix, and they mark up and sell. He's AMAZING--i then took a dresser that needed a LOT of work and he made it look so fantastic I am now using it in my living room so I can see it more often. He is hard working, talented and affordable. I've taken other pieces since then--he's my go-to!" Christine C.
Truly Beautiful Furniture: "I first worked with Hank three years ago when I bought an old, beat-up Singer sewing table on craigslist. I was worried that the $100 I'd spent was way too much given the condition, but after a few days with Hank, it had been transformed into the most beautiful piece of furniture that I own. I was hoping to make the table presentable, but he made it truly beautiful. Since then, I've also brought him an old record cabinet that I probably had spent too much money on given its condition, and his restoration of it was also quite impressive. I also bought a beautiful Broyhill Saga coffee table from him last year. I'm sure I'll buy from him and/or use his restoration services again." Jordan M.
Mid Century Modern Expert: "I've used Hank Tosh at Toshmahal for several refinishing needs including an original Arne Jacobsen table and a 1960s walnut credenza. He's a midcentury modern expert, so he understands woods and finishes from the era. I also used him to lacquer a set of mid century cane chairs. Everything has always turned out to be simply stunning, and his work is absolutely flawless. Remarkably, his prices are very reasonable. I can't say enough good things about Hank and his work!" Rebecca S.
Best in the Business: "Hank refinished a Broyhill Sculptra credenza for me that needed a lot of love. The credenza turned out absolutely beautiful! Hands down, Hank is the best in the business!" Jennifer G.
Stunning Results: "A couple years ago I was fortunate enough to acquire an insanely rare mid-century Clamshell Sofa designed by Seymour J. Weiner for Kodawood Furniture Company of Miami, Florida. While the Clamshell chairs are ubiquitous I have never seen a SOFA with the original upholstery. The back of the piece is wrapped in walnut that with a very tired (but original) finish. Hank refinished every bit of wood in the original finish. It looks stunning! It surely could not have looked this beautiful when it was new. His crafsmanship and ability to restore original pieces faithfully is astounding. He also refinished a mid-century side chair that I only know to refer to as a Bandak chair and have never found another one. Again - stunning results! My little Arka chair is next on the list. Thank you Hank!" Christopher C.
1951 Philco Restoration: "Hank Tosh at Toshmahal came recommended from an Antiques Radio Club as a furniture refinisher for antique radios. I was looking for someone with a great reputation for quality work with a respect for restoring antique pieces back to original state." Caroline D.
Toshmahal: Hank Tosh's name is spoken in a tone approaching reverence by mid-century mavens in the Dallas-Fort Worth area. He has been called The Furniture Savior, and not without reason, because he works restoration and refinishing miracles. Toshmahal turns out some of the most breathtaking pieces in town.... read more. Super Top Secret Source: Hank Tosh: Hank Tosh specializes in refinishing mid-century modern furniture, and he's my Super Top Secret Find of the month. Hank's clients include Emily Summers, the Stoneleigh Hotel, Sputnik Modern, and Century Modern. Designers almost never reveal where they get their work done... read more. Hank Tosh, MCM Furniture Savior: Because we're coco-poofs crazy about MCM furniture, we've had Hank Tosh on our radar for some time. Hank owns and operates Toshmahal in Dallas, where he restores and refinishes furniture and also does custom framing. This man truly appreciates mid century and deco furniture and is an artist at what he does... read more. The Saga of Our Mid-Century Sleepy Hollow Chair: This spring, we found ourselves a tad flush, which meant, of course, that the money must be spent ASAP. We decided to restore some mid-century pieces, one of which was this chair (the cat stayed home). Apparently, this is what's known as a "Sleepy Hollow" chair... read more. The Wood Wizard: There is something about an amazing restoration job that makes my heart go pitter-pat. These projects from Hank at Toshmahal are so absolutely remarkable, my chest might just explode from all the pitter-patting that is happening right now. This guy is a true artist... read more. Hank Transfer: Hank, or as I like to call him, the Wood Whisperer, is at it again. He simply couldn’t allow this beaten-up and sloppily painted piece of furniture pass him by untouched. (And what was up with that color combo anyway? Blue and … muted plum? Blarf.) He figured there was incredible potential lurking beneath. And, he was right. As ushe... read more.